How Many Solar Panels & Batteries Do You Need For Your Off-Grid System? How do you figure out how many solar panels you need on your home? If you are just trying to run lights and maybe a refrigerator, it is not too hard to determine the number of panels and batteries yourself. So how do you figure out how many solar panels and batteries you need? The first step is to determine how much power the appliances and lights you intend to run draw. There are a couple of ways to determine this. The wattage of a UL listed/approved appliance can usually be found near the AC power cord. This may be in amps or watts. If it is in amps, a simple formula will let you convert it to watts: Volts x Amps = Watts. In other words if your appliance draws 4 amps, the formula would be 120 x 4= 480 watts. Another method is to use a Kill A Watt Electricity Usage Monitor. This is an inexpensive device that monitors how much power your appliance uses. If you don’t have the patience for math calculations and want quick answers, this is probably the best way to go! I wrote a detailed explanation for how to use the Kill A Watt in this article. The average refrigerator use varies from as low as 200 watts for a new Energy Star refrigerator to as high as 600 watts for an older unit. At startup, your refrigerator may have a higher draw, so you want to err on the high side when you figure how many watts of power you need. Also, determine the wattage of any lights or other items you intend to run. How long will you run that fridge and those lights? Once you have determined the wattage, you need to run all your appliances. Determine how many hours each day they will run. For instance, your refrigerator can run approximately 1/3 of the time during a 24 hour cycle, or 8 hours a day. The light that draws 75 watts may run 3 hours a day. Once you have determined how many watts you use a day from each appliance, add them up to give you the daily watt-hour results. Now, to allow for bad weather when the sun doesn’t shine, multiply the daily watt-hour result by three. This provides a buffer, in case you aren’t able to recharge the batteries on a daily basis. Because you should not discharge the batteries below 50%, multiply this number by 2. This will give you the total battery capacity your system needs to store to run for three days. Or in this example, 14400 watts. What size of battery bank? Now we will calculate the size of the battery bank you will need in amp hours. Amp hours are used because this is the standard by which batteries are rated. This is determined by dividing the total battery capacity required by the voltage of your batteries. For example, if your system requires 14400 watts, you would divide 14400 by 12, which would show that you need 1200 amp hours. Divide the total amp hours by the amp hour rating of your batteries and you will have the number of batteries you need. For example, if you have deep cycle batteries rated at 300 amp hours, you would need 4 batteries. The Vmaxtanks brand is one of the highest rated deep cycle battery brands that I have found. With these calculations in hand, how many solar panels do you need? Again, this is just a matter of a math calculation. Divide the daily watt-hours by the wattage of your solar panels, times the number of hours of sun. If you have a 75-watt panel and 5 hours of sun per day, you would produce 375 watts per day per panel. Now divide the daily watt-hours by the wattage produced by one solar panel. Using the 2400 daily watt-hour figure from the above example, you would divide the 2400 by 375 and need 6.4 panels. Always round this off to the higher number. For this system you would need seven 75-watt solar panels and four 300-amp hour batteries. If you were using 200-watt panels, you would need only three panels and four 300-amp batteries. If you’re intrigued with solar power and its uses, in this article I explain a simple way to turn a simple 12-volt battery pack into a small solar generator and more explanation for building a small solar system here. A portable solar sytem on wheels is another versatile option for solar power and in this article you can see photos and simple instructions. I recommend learning the fundamentals of solar power on small projects like these and then using that knowledge on larger projects, such as a system to power a home or man cave. A Simple 12 Volt Battery Pack. This entry was posted in solar and tagged energy, grid, panels, power, solar. Bookmark the permalink. 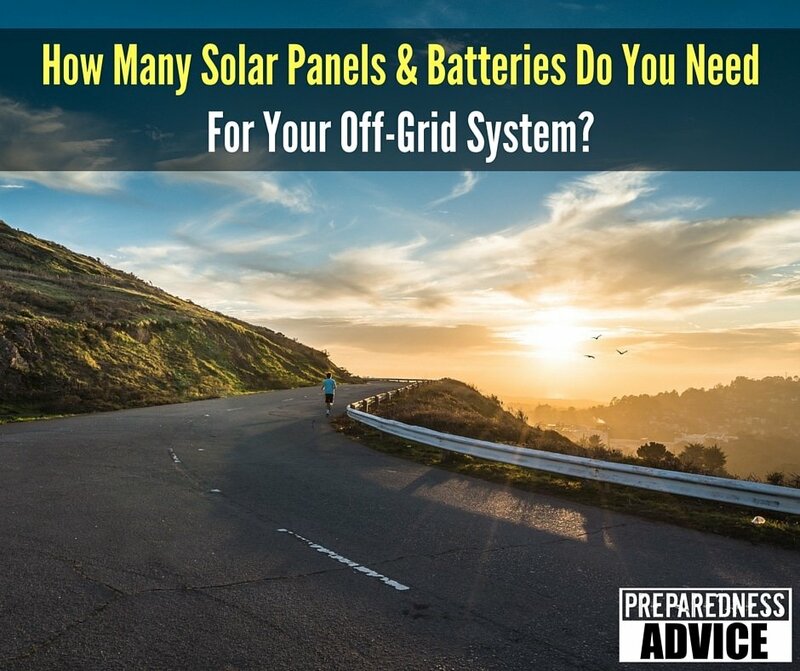 195 Responses to How Many Solar Panels & Batteries Do You Need For Your Off-Grid System? Very timely, thank you. We are in the process of specifying a solar system for our ranch. The panel estimation seems very accurate. For example, we consume about 1500 kWh per month, which averages out to about 50 kWh per day, or 50,000 watt-hours per day. The panels we are considering are 250W, multiplied by 5 sunny hours, gives us 1,250W output per day per panel. 50,000 / 1,250 indicates 40 panels. However, assuming some DC-AC conversion loss, divide that by an expected system efficiency of 0.85 gives us 48 panels, after rounding up. My confusion comes in with your formula for battery bank capacity. Why 3 days worth of storage? Even on cloudy days, there will still be some energy production. We are considering the Trojan 2V – 1110Ah batteries in series to create a 48V battery bank. If we take our daily usage of 50,000 Wh * 3 days * 2 for the 50% depletion, that gives us a figure of 300,000 Wh. Divide that by the 2V batteries, each with 1110 Ah capacity, gives us 136 batteries required. Something seems off there. Can anyone help shed some light on this? You asked about 3 days, this is to give you a good power reserve. With a system the size of yous you may be able to make this smaller and just plan on using less power if faced with a situation in which the batteries are slow to charge. I know that there are some variables that come into play with a system this large of which I am unaware. I am glad to see that you are using the 20 amp hour figure instead of the hundred. I would also double check and see if my daily usage was really that high. Yours is well above average. admin said ” I would also double check and see if my daily usage was really that high. Yours is well above average. I’m right there with Anonymous Citizen as in my household we use adv of 1400kw per month over a years period. Still have 2 adult kids living with my wife and I using too much IMO. 50kwh per day really ? You should try doing some conservation before trying to live on solar. Sounds to me like you haven’t looked into enough low energy alternatives to normal electricity usage in this country. Do some research. You shouldn’t ever use electric heaters of any kind including water heaters on solar, low energy light bulbs are a must and turn those things off when you leave the room. No electric grow lights either. Solar requires a bit of a lifestyle change. Actually you have every calculation correct with the exception of the batteries. The wattage on those Trojans are 1110 ah x 2v = 2220 wh per battery. But batteries are rated on 20 hrs of use. So it’s 2220wh x 20= 44400wh per batteries. You are calculating 50% battery use so it’s 44400 x.50= 22200. So here we go! 300,000 divided by 22200= 13.5 batteries so I would go for 16 16 batteries to be on the safe side if I was you. But I would double check those figures with a pro first. Your Calculation, for the most part, is accurate. If you are using 50KWhrs of Energy per day and you want to have 3 days worth of back up (at 50% Depth of Discharge max) and you may want to use the 2V Trojan cells at 48V per string. you will need a total of ~300KWhrs of batteries. That’s a big battery! That would be nearly ~6 parallel strings of each 24 series-connected 2V Trojan cells (assuming 1100 Ampere Hours per cell). I would recommend using ONE string of 24 cells in series each at 2V and 2200Ahrs or higher which will give you approximately 1.5 days of autonomy. I would also highly recommend using Lithium Ion instead of Flooded Lead Acid. I know they are 2X or 3X the cost, but look at their cycle life performance and also usable energy curves. You will be much happier. Although, I must say if you end up using the Trojan Industrial line RE series they are very nice as well and we have had good performance with them. Also keep in mind that you have to size up your system considering an energy balance vs. peak power analysis throughout the day. Use and Excel sheet and write-down every appliance and power user for your building on each row. Add the hour by hour power usage (in Watts) for a 24 hour period in columns. estimate when various loads will be on etc. Total up horizontally and then vertically. Plot the data and see what your peak production looks like (in Watts). Multiply per hour peaks by the percent of time they are on for that hour and you will get hour by hour KWhrs (energy). Total up all the hour by hour energy numbers horizontally so you have a total energy use per day (should be around 50KWhrs as you have already figured out). Also look at what your critical loads are during the autonomy days. Also add min and max for your PV system during cloudy days and sunny days at your latitude. Also make sure you are using NOTC data from your PV not STC. Add other factors for your battery, besides DOD and the KWhrs you have calculated. Make sure you consider the operating temperature of the batteries. Also don’t forget that your batteries provide the current for the load at 48V and your actual usage after your inverter (assuming your building is at Split phase 120V/240V.) make sure you have the peak current in mind when you are sizing up your system. Remember that the battery and system voltages are at dangerous lethal level. be careful! These are all just a few guidelines. I would highly recommend getting a system designed, installed and tested by a local professional in the OFF-Grid/ Grid-Interactive with battery back up business. Hope this helps. This is such a great article. Thank you for providing us a concise calculation about solar panel system . Very informative article! Solar panels are such a great way to save money and protect the environment. In my opinion, it’s definitely an investment worth looking into. Thanks for sharing! This Article is very timing for us thank you. I do have some question,i.e. from which country better get solar panel and also the battery ? You need to know what the average electrical consumption is for a 24 hour period. Get a watt-meter and plug it in between the outlet and your freezer for 24 hours and this will tell you actual consumption. You should do this on a typical summer day and a typical Winter day to get a more accurate average. Let’s say that is 1 kWh in a 24 hour period. So then you need to size your solar for this. Determine your average solar insolation for your area. For example say you get 5 hours equivalent to full sun then one 200 watt panel would give you the equivalent of 1 kWh. BUT when you factor in losses and factor in the need to power the freezer during a cloudy day this will not be adequate. SO I would suggest you add at least 50% to cover losses incurred in charging the battery, in extracting power from the battery and inverter losses converting to AC. Then you have to factor in the likelyhood of cloudy days. Where I live it’s cloudy from September to May. Most books will tell you to have enough reserve to survive three days without sun. SO that means multiply your one 200 watt panel times 150% to cover losses and times 3 to have enough reserve for cloudy days. That gives you 900 watts, just to be on the safe side round that up to 1000 watts. Then there are the batteries. This is more complicated and depends on unknowns so I can’t give you an answer. Probably at least two good 12V deep cycle batteries but it could be 4 depending on various factors. Can an expert on solar panels give me the number of solar panels and batteries to power a house with the following. You would need to know how many watts each uses per day or watts used total per day. Example on lights. You could be using 100watt bulbs or 60watt bulbs or led and each will give you different usage for the same amount of time it is on. Your freezer and Fridge don’t run constant they cycle so you need to know how many watts they use in a day. do you have a DU power installed if yes try using grid tie instead on running off grid. Thanks for answering these questions, Richard. I actually just got a job in the solar industry and hope to be able to share some of what I’ll be learning here on Preparedness Advice. If they run 10 hours per day then you can calculate the wattage by this formula: amps x volts = watts. Your usage would then be watts x the 10 hours. How many solar panel (250W) and battery (200AH) do I have use for a 10KVA load / hour? “solar system for our ranch.” Did you see that it is not a house in town! Maybe several outbuildings to deal with and a few high watt use items that can’t be just not used or turned down? I hate it when people always assume it is a waste of energy instead of needed use of energy! Also what difference does it make maybe he just want to cover what he want to use. I have a house built in 2003 have leds for lights and in the summer I use 38 KWHs a day and am not cool all day or night! I turn off everything when not in the room or in use. I wish that when a question is asked and as many details given as he did everyone just answer what they can and not get on the save more band wagon! I know it’s a whole year later, but I wanted to share what we ended up putting together. Our needs were very similar to Anonymous Citizen. Most golf cart sized deep cycle batteries eg Trojan t-105 can hold around 200-230 amps capacity at 6 volts. with a total of 1200 watts capacity, they make 12 volt batteries in the same form factor too but hold less amp hours like around 100 ah, but still with a total capacity of 1200 watts since they are higher voltage eg. volts × amps = watts. Figure for a max cycle discharge of 50% so usable energy = 600 watts Per battery. Energy required is 12000 watts so 600×20 batteries = 12000 watts not including lossses incurred with converting the power from low voltage dc to high voltage ac at about 15% loss, so stored power required would actually need to be 13800 watts ÷ 600 watts Per battery = 23 t-105 style batteries or 2300 amps at 6 volts or 1150 amps at 12 volts etc. Keep in mind 23 6 volt 200 ah batteries is including the 50% discharge value that you should not go below to maintain decent battery life. I just installed a system in Baja MX and the installer used 2 250 watt panels(good inverter and wired correctly) but I am concerned that the batteries( 2 200 amph 12 volts each) is not enough battery storage. We operate a 6 amp(120 volt 16 cubic refer and 4 lights(led 20 watts each) Plenty of sun all day and we only use the cabin for 4 days a month. Does this seem adequate? Simple formula for estimating how many solar panels and batteries you need? First use a kill-A-watt meter and calculate 24 hour usage. That will be your daily usage in kilowatt hours. Second understand batteries. I am only going to talk about the big #27 marine and 6 volt golf cart batteries. Whether 100 amps @12 volts or 225 amps @6 volts, these batteries will only give you back about one kilowatt for an hour each. Yes I know the math says a little bit more, but you have losses in both charger and inverter. To get that kilowatt hour back in your batteries, your panels have to put in 100 amp hours from the sun before it sets. In a perfect world that you use 1 Kwh per day. One 100 watt solar panel in 10 hours of strong sunlight every day into your battery and you are self sufficient. In the real world never drag your batteries below %50 charge. Its cloudy every other day? Only 5 hours of sun? Now we are at 800 watts of panels and 8 batteries for your kilowatt per day. That’s how it works in the real world,but at least you have a week of power at your place after the sun goes out. A battery will give you 1 kilowatt for one hour. A 100 watt panel in 10 hours of sunlight will fill that battery. Thank you for real world advice!!! Thanks very much for your time and advise. I blew my overload relay on my refer. I plugged in 3 13 watt lights and my refer blew this overload relay so the compressor stopped working. My question is: can a bad inverter cause a surge like this? the inverter is brand new. Hi guys glad i found you,i live off grid and mainly use wind turbines and generators,i currently have 2 banks of 350ah 12v batteries,then run from turbine shed to house via inverter,im now looking into solar panels,how many panels would i need to keep them topped up? This is all i use in the day. 2 banks of 350 Ah batteries are 700 Ah. 700 amps x 12 volts = 8400 watts for an hour or 350 watts per hour for a 24 hour period. Read my post above for how many batteries and how many panels I would estimate you need and multiply your usage accordingly. I am installing an off-grid solar system and am concerned about an EMP wiping out some of the components. There seems a consensus that the inverter would get fried, but I have also heard the diodes in the solar panels would fail and wonder about the charge controller. I see two ways of retaining usability after an EMP attack or CME: 1) do not use the system, keeping it only for standby use after an attack by keeping critical parts in a Faraday cage; or 2) use it but keep redundant parts like a $2000 inverter in a Faraday cage. Either way, it seems expensive. Any ideas? Nels, you have the best information currently available about CME or EMP protection. No one knows for sure the effects that another Carrington event would have on solar panels and the IC’s in controllers or inverters. One thing is for sure, the copper wires running to and from all electronics will function as an antennae or conduit for EMF to the electronics plugged into them. Keep non essential and spare components unplugged from long runs. Grounding is important for panels AND wiring in your system. When in doubt run a ground wire. Voltage always takes the path of least resistance. Effective grounding will lessen damages. Having spare components in a grounded metal box will give you some hope of resurrecting your system if such an event occurs. How many batteries and solar panels (200W) will i need to provide 3000W per day of consumption? The article was written pretty well explaining the math needed. Several responses were written explaining the math also. You need 3 kilowatt hours of electricity per day (3000 watts for an hour). If you have 10 hours of sunlight and 300 watts of panels into three 12volt 100 amp hour batteries you will be OK. This would be unusually good conditions, you should probably double that figure. I have 3 deep freezers on my shop and a fan cooling system. I would like to have your advice. How many solar panels and battries required to run my 3 deep freezers. First you need to know how much power you use a day. In Central & South America as well as Africa, some folks will take clear 2 liter soda bottle and put them in the roof like a sky lite. Close to 40 watts of light. I can’t remember if they added clear water to the bottle or not. A good seal would be a caulk of some kind, but also a rubber boot like you might use for a vent pipe or sewer pipe coming thru the roof. An estimate would be to take the total watts and divide by the battery bank voltage. So if you have a 24 volt system that would be 60 amps of charge controller you need. 4 hours at max watts of 1450 would be 5.8 kwh supplied each sunny day. 4 – L-16 – 6 v batteries in series would give you 400 ah x 24v = 9600 wh storage. If you discharge to 50% then you need 4800 wh x 1.2 (loss factor) = 5.7 kwh which would just match your supply. I have seen people using much higher daylight hours on this forum to determine the wattage supplied but that is just not true. You get nowhere near the maximum input on your panels throughout the day unless you use a tracker which is expensive. Best to use the 4 hour rate for a fixed system. Your panels would only charge 13 batteries in 4.5 hours of sunlight. If you add another 100 watt panel you would be able to fill 18 batteries. 16 batteries will weigh a half ton. In a cargo van you are probably going to have to learn how to get by with less power. I don’t see how you will be able to store a second or third day of power unless you use a generator. A propane refrigerator would probably be your best bet and only run air conditioner while the sun is shining. Cut your consumption in half, use 8 batteries and add another 100 watt panel and you might have your minimum for a day, certainly not for a second day. I am sorry, I was wrong, I was thinking 16 kilowatt hours daily, you are only using 1.6 kilowatt hours. That’s about one and one half batteries. 4 to six 6 volt golf cart batteries will last you 2 to 3 days. Your solar output will be 4.5 hours x 300 watts or 1350 watt hours per day, you need another 100 watt panel to get you to 1800 watts per day. I am sorry but I don’t know anyone in southern Ca who builds off grid systems. Maybe one of our readers can offer a suggestion. i also have a big challenge in sizing solar system. I have 12volt 2400ah batteries bank, 20panels of 120watts and solar regulators of 60amps two of them, and an inverter of 5kva. I connected the solar panels in series the batteries could not charge well and when I changed the connection, the batteries were well charged but the inverter blew immediately. Now what could have gone wrong I don’t know I need a help. hi. Like this discussion page. We have a 90 ft yacht that would have similar fixtures and apliences to an apartment. I will do all the calculations before we buy but my rough guess is 1000 watt of solar and 2000 ah of battery will reduce how often we need our generator. Sunlight is provided by the Bahamas so long days. As a rough guess do you think this seems close to the size required. I like this website for helpful prepping advice too. This thread is overall good for solar discussion. The solar/battery questions are somewhat complicated with many variables, but not if you understand the basic math as the thread contains. I have been off grid for 20 years and started buying panels when they were over $10/watt. Prices are much lower now and the equipment is much cheaper and better quality thanks to competition. The best way to learn how solar works is to actually buy the components and do your own tests. I have been very pleased with Renogy products, prices and their tech support. Perhaps just trying to get one circuit at a time off the grid or generator is the best teacher. 600 watts in panels with a 60 amp MPPT charge controller and 1500 watt pure sine wave DC-AC inverter is a realistic minimum. Start with at least 6 or 8 deep cycle golf cart batteries you may buy more as needed. The total costs of these components will be a little over $2000. The payback starts as soon as you get it running and to me independence is worth more than the cost. I required 2 tons refrigerator which is run by solar with daily 24 hours, (not a single second it is stopped) with temperature of -5.5 degree centigrade ),how many solar panel of 250 Watt and how many batteries I require? Please assume my daily amp. use. I have a small house on an island in Bahia Brazil, Climate is much like Florida. We are off the grid and have no chance to have power other then what we can provide. I use 850 kwk per month in Florida and think this would be a safe number to use in for powering the island house. my question is how many panels & batteries ( size of batteries & Panels ) money is tight we are retired. Hi, thanks for the article. I need your help. I live in IRAQ and we have electricity problem since more than 10 years. So i’m thinking of the solar system. Now in our street we have a 100 KVA electricity generator has been sat up couple of years ago that supply’s power to many houses in our street but only for 8 hoers a day. my house share is only 10 amp, i pay for that 10 amp in monthly bases. for that 10 amp i can run 1 refrigerator 2 TVs, 3 fans, and all house lamps. My question is. what do i need to buy to generate 10 amp 24 H /7 D for my house? please kindly advise how many panels? size of each panel? battery …etc . i want to know if i will have enough space and room in my house and how much that will cost me. specially our houses roofs are not like yours, we have flat roofs that we can go walk and put stuff on it, and sometimes we put our beds on the roof and sleep at night 😀 . as there is no electricity and its too hot to sleep inside. Can you get solar panels with more than 300-315 watts? give me suggestion! how many batteries (12 voltl) do i need for 1000 watt solar? I don’t know how to build a battery. I use 600 watts a day for 8th ours what do I need to run that in solar system ? Can you estimate your daily use from your electric bill? Yes, the kwh on your bill are kilowatt hours. Multiply by 1000 to find the number of watt hours. For example 2.4 kilowatt hours x 1000 = 2400 watt hours. Thanks for the information on Solar Energy. This is going to help us a lot in Nigeria. I have a solar 1000volts. How do I determine the watts? It has other details written as AMH 4mm2. 1000volts Solar is rare. If this is on your house then you may have your terms confused and it is 1000 Watts solar. Great freezer, never saw one before. Do you run it on Solar and batteries now? More batteries take you thru the non solar times. That means more solar to charge the batteries as well. Work on energy efficiency like LED lights, efficient appliances and an efficient set up to begin with. Long wire runs equal wasted power just like ghost loads in an entertainment system, computers and cell chargers. how can i run my 0.5 hp water pump only 3hrs a day so what can i need for whole setup like how many watts panel,battery,and inverter. Too little information, if it just needs to run 3 hours and it doesn’t matter when then just run solar to a DC pump. No battery and no inverter. If you need to use the water under pressure at non solar times then put the tank up high and use gravity. If that’s not an option then you need Solar and batteries for the DC pump. To run a .5 hp pump you need 372.85 watts. Divided by 12v that’s 31 amps and 93 amp hour battery for it to run for 3 hours. I don’t know the type or voltage of your pump or any inefficiencies in your set up like wire length, voltage drop etc.. but hope this gets some basics in your hands. Hi I have four 150 watt panel and two 150ah batteries. But My per hour consumption is 1000watt of ac. How Many Panels and battery should i have to get 15 hours of uses. I need a solar system to only light up a rural house using eight 2-watt solar bulbs and a single phone charger. What size panel do I need and which charge controller? Sorry, can you also recommend a battery? Dear sir/madam i would like to ask i have a battery cycle .that need 12*4=48V each battery 100amp hr.every date 10 hours working . now i want to do make one charge by solar panel and battery back. I made 3 solar panel producing 40.3volt when connected in series. Can i use this with an inverter of 800-1400w, and with 12v battery connected in parallel or 24v battery connected in series. I want to know the right way to do this connection. how much current does one cell produce??? How many solar panel (250W) and battery (180AH) do I have use for a 15KVA load / hour? My prayers for seeking such info have been answered. Thank you sir! I want to run system of 650watt equipment or 16 hours, sun hours in my area is 7 hours . How many solar panels of 150 watt and batteries do i need? the big flaw in this is that solar cells are rated in a lab under PERFECT SIMULATED SUN with no clouds bird shadows or other reductions….. including dust. real life instances are rare and almost exclusively in the soutwest. in addition they are pointed directly at the simulated sun. thats why they make tracking collector array mounts. if the array is stationary, even mounted ideally, you can reduce the output by 50%. then there are the batteries. while they are called deep cycle it refers to the capability without damage…. they do not furnish full voltage but approx. HALF the rating.. appliances wont run at less than 11vdc. inverters shut down at 11.5vdc. there are also numerous mistakes in the load estimates…… rule of thumb. DOUBLE the textbook design results for a reliable system. Good point. I’ve built a few solar systems for homes and will have to write on this topic in the future. OK, so how many times are we going to say, “How many solar panels does it take to do ” or “How many batteries do I need to do “. This is why people get so confused. Somebody please make a matrix, just like load tables for joists used in the building industry. Otherwise this thread will never end! That made me laugh! I’ll see what I can do. I have a background in electrical work and have designed some solar systems myself. From comments it is apparent that your product is NOT user friendly! I’m not selling a product. Just explaining how to do a simple calculation for figuring out how many solar panels and batteries a home would need to operate the most basic necessities. I’ll work on adding additional articles in upcoming weeks. Quick question. I have a window AC (120V. 4.5amp) on 200 watt panel, Two 75AH deep cycle batteries and a 1,000 inverter. the AC compressor does not kick on. Do I need an additional 75AH battery? This is my situation… I try to install a 24/7 refrigerator (off grid) in a ranch where obviously energy lines don´t reach. This is a great subject thread. I may have put the cart before the horse, or in this case the Solar Panels before the Batteries. I bought 10 230 watt panels for a total of 2300 Watt for my new 16×40′ detached garage (man cave) shell which i’d like to make off grid. Living in Florida, eventually this will also have a 16×10′ enclosed air conditioned room and I’ll add more panels if necessary. I also have a 3500W 12V DC to AC power inverter with up to 7500W peak power. I know I still need a charge controller, connectors, power box, switches etc. I’m ready to buy Batteries and build the battery bank. Any recommendations are greatly appreciated. What would you do? Any system you build, you have to determine what your actual load is going to be. This is relevant whether you’re putting a service on a house and tying it to the utility grid or building a solar array to function off grid. Make a list of what you’re going to put in your man cave and what their energy usage is going to be. If you haven’t done this yet, do it before you buy your batteries. You can always add more later, of course. The market is starting to produce more off grid devices/appliances that you can directly tie into your system without the need for inverters. I am planning to install a solar power system at my home. I have 3Nos. of 1/2 AC and approx 200 watts of Refrigerator and 10Nos. of 40watts of lights. Would anyone tell me how many solar panel (300 watts), Batteries (Which specs) and inverter (how many watts) I need ? I am planing to run it 18 hours a day. Is it possible? How many batteries will I need to be able to run this system each night for the periods decribleds above, and how much 315w panels to be able to charge those very batteries, being ready for each night? Do I need more than 1 battery and one 315w solar? Im preparing to purchase five 100 watt solar panels and already have 10 Enersys Oddyssey 12 volt 185 amp hour AGM batteries for my bank. The question is what amp hour rated solar charge controller would be appropriate? Theoretically, the panels would produce 60 a/h at 12 volts but battery charging really requires a solid 18 volts or more, correct? Should I do a combo of parallel and series panels to reduce the amperage but increase the voltage? If so, whats the best controller, regarding amperage? If not, whats the best layout? Thanks So Much. I am confused with all the calculations you explained, really is hard for me. I am in Florida, I would like to know if is possible, to tell me what I need to run a refrigerator and a freezer, both 800 Watts. I have already a 100 Watts solar panel, 2 batteries 12 volts ea.-650watts ea., 2 charges controllers 30amp and a inverter 2000watts. The charges seems that charge and discharge at the same time the juice put in the batteries. This is a project that my husband (84 years old) is doing and he is deaf and I must to make calls to try to get answers for him and he running me crazy with this, please I need HELP. I will appreciate it! Hi to all its a very nice information about solar panel..but please kindly help me to this,we consumed only 60 to 70 watts daily please kindly help me to know how how many watts of solar panel and batteries in need to buy..thanks in advance and God Bless..
We have had no sun for one month. What would happen to the solar power? Would it get enough charge from thirty gloomy days to carry through until sun comes out? I want to run my swimming pool pump on solar..1hp what do I need in panels and batteries..should run at least 5 hours a day. what panels and batteries do i need? Two pcs of Solar panel @ 100 watt capacity assuming 5hrs of sun. Two pcs of Battery @12vdc 200 amp-hours. i want to run 2 fan and 1 lcd tv and 2 led bulbs 8 watt each. is 300 watt solar is enough only for day time. I have install a 600 watt Mono Solar Panel system at my home. I have 6 Nos. Ac 100 Watt Fan Ceiling Fans & 2 No’s DC 35 watt Ceiling Fan Watt , 20 Sever Blub 25 watts , and Medium Size Refrigerator. Would anyone tell me how many solar panel to add more , Batteries (Which specs) and inverter (how many watts) I need ? I have 3 250 watt panels, all i want to do is have my 500 watt window unit to run all night till i get up which without sunlight is about 12 hour’s. How many batteries do i need? What preference? Any advice helpful thanks!! Setting up my off-grid system at my hunting cabin. I want to run TV, lights, directv box and a small AC unit. I figure 1500W inverter with max surge 3000W. My question is this: how many batteries can I hook up to the inverter to store power and how do they connect? Please check with the installation instructions. Depending on which inverter you use, there will be limitations on how much capacity the inverter will be able to handle, both input and output. How many panel and battery do I need for 21 bulbs ( 20 watts ), 4 ceiling fans, a radio and LED 40”TV? Simple math. Whether you are calculating by Watt hours or Amp hours, the total load served must be calculated using the same measurement. Amps are the best for baterries since their capacity (run time) will probably be the factor you are most concerned with. I’m assuming you have them arranged for the operational volage you are wanting to use. 60W light bulb, 5.2A (120V) refrigerator. Bulb (60W/120V) .5A + Frig 5.2A = 5.7A. If my batteries have a 13Ah capacity, as arranged, I could run these two items for 2.3 hours. How does a fridge work with solar? Do you plug in the fridge? Do you get sockets installed? If it is a regular (AC Volts) fridge, you will need an inverter between the DC Voltage of the solar array and the appliance. So your batteries are down to 50% and you need to run your house too. Your panels should be able to run your house and recharge your batteries in a reasonable time during a time of the year when the sun isn’t shining and maybe you are using more than normal because of the weather. If you’re off-grid then you have a problem. Great article. Very useful for me. Now is there a similar article about choosing the correct charge controller and choosing the correct inverter? These are still mysteries to me. Thanks. I have a 24vdc input 5000watt/20000watt psw inverter. I have 6x 160amp deep cycle 12v batteries, in 24v series/ parallel formation, meaning 3x24vx 160amp. i am having 315w solar panels 2 and 1 inverter and 180ah battery .so how much capacity change controller required. I want to know how manny pannels and what size and how many batterys i need please, i want to have my fridge, deepfrezer and lights X 12 and my tv and alarm running please. Can you please supply me with this info. Power rated 3kva inverter/charge contoller. Power output 24vdc, 100a. Please advice if i can add (1hp) a/c 9hrs aday of usage…as regular usage fridge is 24hrs usage.. Thank you for this article. I’m a bit of a newbie on solar and I appreciate your clear and organized article. Could you kindly elaborate on the effect of the starting current for the batteries? I’ve read some people use a multiplier of 3 or 6 for the required starting power. Will this mean, aside from the daily watt-hr requirement, you’d also need to add an allowance for the 600% requirement of each appliance to start? Ex. 2HP air conditioner (around 1.5-2KW running) would need about 12KW to start (using 6 as a multiplier). Wouldn’t this drain the batteries instantly if it is not considered? Hopefully a simple question. Is there a rule of thumb for “X watts of panel array” for “Y amp/hours of battery bank”..? I’m considering doing a fairly large pv system to power one level of a house we’re building; possibly as much as 6,000 watts of panel array. I’m fine with calculating my daily watt/hours of usage; I’m just completely lacking in first-hand experience with large scale pv systems. If I’m understanding the C/20 rule, it sounds like I’m looking at an absurd number on the battery amp/hours for that size of panel array. Curious what I’m missing, and frankly what others would use battery-wise; in terms of “amp-hours per 1,000 watts of panel” or similar. Thanks in advance, from an admitted noob on the subject. What would I need to power my water well ? It’s 220 volts and I need it to run at lease 12 hours a day. Can you help me out with a list and price ? assuming 12V batteries to get amp hours. if your batteries are a different size, you would divide accordingly. I find your electric math tutoring a blessing. Trying to build a teaching urban agricultural extension, off grid, for all schools. I am planning to install solar power at a hunting cabin. We are only there 2 days a week. We will only be running 4 lights, a ceiling fan, a coffee pot, charging phones and maybe a radio. We wired the cabin and have a breaker box in place. Any suggestions on what solar equipment I need? I have a question on the panel calculation used in the example. I’ll use different numbers to simplify my question. If my daily watt hours is 1000 and I get 5 hours of sun the calculation shows that a single 200w panel would work. Even assuming no loss, which isn’t realistic, shouldn’t the production of the panels be greater than the daily usage to allow for recharge of the batteries? If they match as in the above example and your usage remains constant, it doesn’t seem you’d ever be able to recharge the batteries if they start to become depleted. we have on average 5.5 hours of sunlight an thinking of getting 315 wp panels . how many panels and how many batteries of what size ..the full shopping list would be good. I’m very new at this so please double check my numbers. You also need to know the utilization of the generator to get a more accurate number but assuming that it is 100% loaded 24 hours a day, this is what I come up with. For panels I come up with the following. 480000 (daily watt hours) / 1732 = 278 (panels). Again, my math or assumption may be way off but either way, it seems a system this size requires involving a professional. There would be loss that needs to be added into the calculations but I’m also sure the generator isn’t running 100% 24 hours a day. I am trying to pump water for a community in Haiti over a hill. I have a submersible pump that I am told needs 600 watts of power. I am designing a solar standalone system for a rural community with a load of 365,262 Wh/day, please how many panels, charge controllers, batteries and inverters would you recommend and ratings? thank you. I AM TRYING TO MAKE A SOLAR SYSTEM HAS A EMERGANCY BACK POWER SORCE. I JUST NEED IT TO RUN A 4 CF FREZZER TO STORE FOOD, I HAVE A 24 VOLT SYSYTEM WITH TWO PANALS AND TWO BATTERIES HOOK UP, AND FULL CHARGE I GET 28.11 VOLT, BUT ON CLOUDY DAY I ONLY GET 23.91 AND THIS PULLS THE INVERTER DOWN TO THE POINT IT SHUTS OFF. HOW CAN I FIX THIS, I WAS THINKING ABOUT 2 MORE PANALS ON THE OPPISITE SIDE OF THE SHED, DO I ALSO NEED TO MORE BATTERIES, MY SYSYTEM IS HOME MADE USING RENOGY UNITS, GOT ANY IDEAS, WIFE IS NOT BELIEVEING THIS WILL WORK, ON SUNNY DAYS IT WORK FIND, THE INVERTER IS ON A TIMER AND TURN ON A 10 AM AND OFF AT 4 PM, AND TH FREZZER RUNS AT FULL CHARGE WITH NO PROBLEMS…. BUT JUST A LITTLE BIT OF CLOUDS AND PSSSSSSSSSSSSSSSSSSSST. You considered just the actual daily watt-hour ( 2400) when sizing your panels, and that implied dividing 2400 by 375. I wonder why you didn’t consider the “buffered” value of the battery bank (7200) or even the new 50% safety value (14400). If the solar panels are expected to charge the batteries at least, then it will require more than 2 sunny days (5hrs each as in this case) to charge those batteries by 50% without an additional burden. Please check. India is now focusing on use of Solar Electricity for homes. This is especially useful in the Rural segment of the country, which is littered with 575,000 villages, each with about 2000 population and where maintenance of steady power supply is not an easy task. On the other hand, there is abundance of Solar Energy in most parts of the country. We have our Institute of Clean Energy Technologies, where we are focusing powering the Rural areas with Clean Energy. For Small rural homes, 200 Watts or 400 Watts ( 2 nos. 200 Watts ) panels will meet the local needs. We are keen to make Charge controllers for such homes, working off 200 watts panels and carrying 20 Amps. We need a good design circuit for this. We wish to have a know-how transfer from you for this as you have an excellent reputation in this field. Please advise if this is possible. If so, please intimate the terms. Hi, kindly assist, I have a 200amp deep cycle new battery, 280watts panel and 2000watts inverter, the issue, after charging to full capacity during the day, at night my battery can’t last till morning with four 5 watts bulb (I.e 20watts) the whole connection is linked to the inverter. Do you think the inverter loss is responsible? Or what suggestions. how many solar panels and batteries do i need to run a 0.5hp submersible pump on solar. We have effective sunshine for a minimum of 8hrs per day. Guys I have a 100 watts harbor fright solar system controller, 750 inveter and a MARINE RV DEEP CYCLE 12V BATTERY SEARS DIEHARD 675CCA. I need 500 watts every hour to run my stuff, at night time only for 6 hours, can you please let me know if this will help me to achieve that. For a solar street light of 30W 12V ,what size of Solar Panel and Deep Cycle Battery should be used? And the numbers of the panels and batteries? And how should the panels and batteries connected-series or parallel? I look forward to hearing from professionals here. Please i will like to build a 4000 w system and i will like you to help me by telling me what type of components that i will need to build it . how do i decide whether to use series or parallel connections on my panel? does the input of the invertor matters? 12v or 24 v? i have two 180 watts panels, a 12v inverter, *4 12v batteries, 20 Amps regulator, and i want to power a freezer, a tv and a juke box machine(common in namibia). whats the best connection i can use? You will need to know the amperage or wattage of the fan plus the wattage of the bulb. After that, calculate your needs using the information in the article to determine your needs based on the way you intend to use the devices. 8A for one hour is 8Ah. So, your 35A battery will handle it. What are the amp hours on the battery? That will tell you how long it can run between charges although you are going to be recharging daily. Your panels will give you about 2.5A charge/hour so 3.25-4 hours a day should get you back to full charge with the battery. Gravitating the explanation of the ratio of p v panels to batteries. Is there an app that will do this if you enter parameters like panel output and watts required plus battery capacity? I remember a programme put out by shell that did the balancing for you around the turn of the century. to support 3000 watt i installed a 5.5 kva 96 volt off grid solar inverter. if i divide 12000watt by 96 volt it gives 125 amp utilization. it means i required 125 amp current need to be generate. if i consider 50% DoD of battery i required 250 ah battery. to charge 250 ah battery i required 10 % charging current it means 250/10= 25 amp. to charge 250 ah batter 250/25= 10 hours. but i have 4 peak hours to charge a battery. it is very confusing pls help to solve this issue if my calculation is correct. Based on the calculation above, does that includes 24 hours? I’m thinking of running my computer, which takes about 400W per hour. So the figures and calculation above…covers per hour? Or how. Hi. I have a 20 watt solar Panel. So how much time to full 6v 4.5 Ah battery. I have solar on my home. How do I make it work all the time and in end times. Please explain to me what I will need.